Magnolia ‘Elizabeth’ opens fully a week or so after Magnolia ‘Butterflies’ begins. I think of Elizabeth as Butterflies’ older sister. Like Butterflies, Magnolia ‘Elizabeth’ is a cross between M. acuminata and M. denudata, but the differences between the two are significant. Elizabeth was created and patented first. It grows taller — about 50% taller, and the sweetly fragrant flowers of Elizabeth are not as yellow as the flowers of Butterflies. Elizabeth’s flowers are more of a yellow-tinted cream. 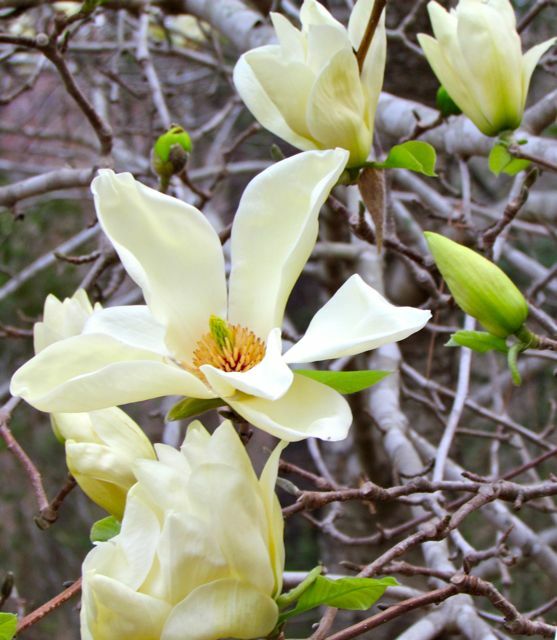 However, Elizabeth’s paler color does not stop a mature specimen from making quite a visual impact in the landscape. This clearing among the pines faces my driveway and is quite close to the street. I like to imagine that passing traffic enjoys Elizabeth’s flowers as much as I do every spring. 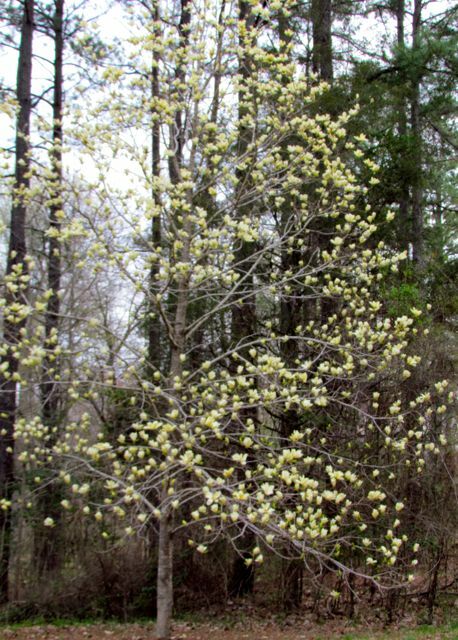 The tree’s graceful tapered form looks lovely even after its flowers are spent and its bright green leaves have emerged. In winter, its gray-white trunk is as eye-catching as that of a Beech tree. And the sweet scent of its flowers cannot be ignored within a 100-yard radius. This picture gives you a better sense of the true color of the flowers when they first open. They fade quickly to a paler cream tone, especially if the weather is warm, as it has been here lately. As with Magnolia ‘Butterflies’, some Southeast Piedmont springs are kinder to Elizabeth than others. A sudden freeze can brown the flowers overnight. But the gamble is worth it for springs like the one we’ve had so far this year, when every perfect yellow bud opens to reveal creamy petals, its sweet fragrance inviting early pollinators to linger till sunset. 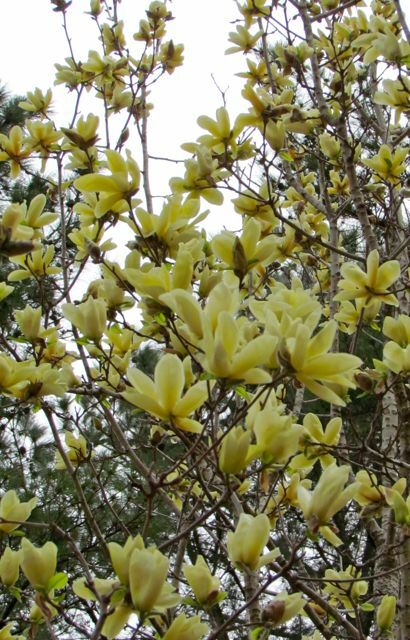 In Michael Dirr’s Manual of Woody Landscape Plants (5th edition), he states that Magnolia ‘Elizabeth’ should reach a mature height of between 30-50 feet. My tree is close to that maximum height and still appears to be growing enthusiastically. It may exceed Dirr’s estimate. Frankly, I hope my Elizabeth continues to grow for many years to come, delighting the eyes and noses of everyone who passes by. This entry was posted on March 23, 2011, 12:44 pm and is filed under Favorite Plants, piedmont gardening. You can follow any responses to this entry through RSS 2.0. You can leave a response, or trackback from your own site.